This year Flickerfest received 1793 entries, of which 108 were selected for the final competition from all around the world. In it’s 12th year, Byron Shires longest running film festival, Flickerfest will screen a selection of multi-award winning Best of International Shorts on Friday & Saturday night; and the Best Of Australian Shorts on Sunday Night. See & support our local film-makers alongside the best in the world at Flickerfest & Byron all Shorts. Food & Drinks Available | BYO cushion | Chairs supplied | Arrive early for best comfort. This competitive local programme will screen on the 22nd January 5pm alongside the Byron Flickerfest 3 day screening’s of the best of the worlds short films. An unexpected chance occurs for two people to re-connect through automotive beauty. Tegan, a young woman that spends more time on facebook & texting than talking to people near her is shocked to learn of a family tragedy on facebok. Discover what’s possible for people with special needs in this remarkable and inspiring music theatre group. A mystical cell animation which explores a curiosity for wolves. A photographer in search for an intriguing composition wanders through the woods as he suddenly seems to find inspiration in the appearance of a mysterious figure. Only the figure is not made of flesh & bone, but of lead & chalk. “RaHOW 2010” is an artistic portrait of the Lismore peace group “Remembering and Healing Old Wounds”, documenting their multicultural, multi-faith events; & the wide support they receive. Culturebank, an Aboriginal dance group Nunukul Yuggera touring through Greece; performing on sacred sites including the original running track in Olympia and the Herodus Atticus at the Acropolis in Greece. And performing along-side Paco Pena, Shaolin Warriors, Voix Bulgares, Tibetan Monks, Sioux and Lakota tribes, Cuban & African dancers and musicians for the opening of the Cultural Olympiad. Story about filming deep tube riding. Impact is a mini documentary about the confronting reality of the fall out from fatal road accidents. The film was created with a group of Northern Rivers youth who shared their stories about how road trauma has affected their lives. The Caretaker is a moving account of a unique sporting history many Australian Indigenous boxers experienced during the last century. Audience Award- voted by those in attendance. In Your Face 1 day edit/filming; Manage Your Film production software; SAE Byron short course in Film; Bangalow Chamber $100. In Your Face 1 day edit/filming; Manage Your Film production software & SAE Byron short course in Film. 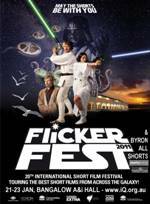 The Byron All Shorts screening will be on Saturday afternoon at 5pm with announcement of the winner at the Sunday night Flickerfest screening.